On the domain administration homepage, you can configure and manage domain-level settings. 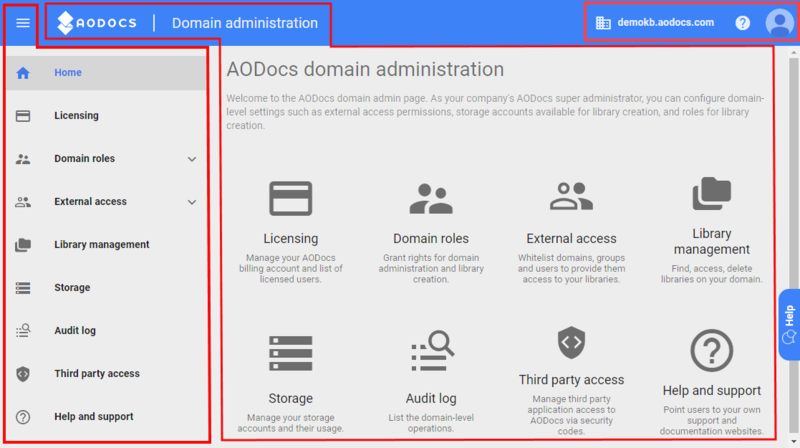 The AODocs domain administration homepage is available only to AODocs super administrators. The domain administration options are available from the menu and from the domain administration homepage. The Menu button expands the domain administration menu. From the expanded view you can open the submenus for Domain roles and External access. The Home button allows you to access the domain administration homepage. Licensing: allows you to manage user licenses and your AODocs subscription plan. Domain roles: allows you to add and delete super administrators and library creators. External access: allows you to add and manage domains, users and Google Groups in your whitelists. Library management: allows you to delete libraries. Storage: allows you to manage the default and additional storage accounts on your domain. Audit log: allows you to track actions performed on your domain and export them. Third party access: allows you to create and to delete security codes. Help and support: allows you to customize the URLs for your documentation and support. Learn more: Customize your documentation and support URLs. This section is available from all sections of the domain administration. The domain administration name allows you to access the AODocs homepage. Note: The links to the AODocs Knowledge Base and Support from this menu are not customizable. Learn more: Customize your documentation and support URLs.